Paul has been a meditation practitioner for over fifty years. He has formally studied with several of the greatest meditation masters of our time, and subsequently has organized and taught hundreds of meditation seminars, disseminating potent practices to thousands of individuals; as well as offering retreats, advanced study courses and a rigorous and profound training program for teachers of Neelakantha Meditation. 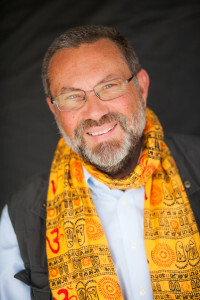 Paul Muller-Ortega has been a pioneer in the technology of Consciousness, lecturing and teaching about meditation and Indian philosophy worldwide. Through his books, articles, essays, commentaries, and translations, Paul has earned a reputation for his unparalleled scholarly authenticity, while being a charismatic teacher with a remarkable capacity to convey esoteric truths and teachings in a highly accessible, relevant, and comprehensible way. He is the author of the highly acclaimed book, The Triadic Heart of Shiva: Kaula Tantricism of Abhinavagupta on the Non-Dual Shaivism of Kashmir, (State University of New York Press, 1989), in which he examines the “Heart” as the mystical core of Consciousness. He has written numerous scholarly articles on aspects of Tantric Studies, and is one of the co-authors of Meditation Revolution. Life is full of astonishment, bliss, nectar. And it is also full of extraordinary challenges that demand a reconfiguration of a higher level of Consciousness within each one of us. We must understand that process and how to most beautifully cooperate with it. Paul earned his undergraduate degree in Philosophy from Yale University in 1971. He received his Ph.D. in Religious Studies from the University of California, where he studied Sanskrit, Indian Religions, and Asian Philosophy and Culture. For twenty-five years he was a Professor of Religion at Michigan State University and then the University of Rochester, and was known for his passionate and innovative teaching style and enrolled-to-capacity classes. With this rare combination of scholarship, experience, skill, spiritual practice, and profound insight, Paul teaches his students to abide in the Heart of Consciousness: a journey that is inspiring, life changing and enlightening.